I'm joining in with The Blended Blog's Friday Loves - Cinco de Mayo Fun today. 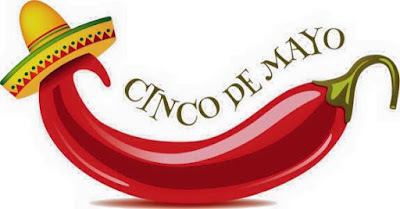 We have celebrated Cinco de Mayo - not this year because Vic is traveling - but in years past, it's a great time to cook Mexican food and share it with friends. Two of my all-time favorite recipes have featured at our Cinco de Mayo celebrations - Mexican Lasagna and Mexican Rice. Both were big hits on the buffet table. And while not strictly a Cinco de Mayo treat, these Snickers Cupcakes were the grand finale.